With its tangy citrus and sweet vanilla, this nutrient-packed smoothie is reminiscent of a creamsicle – but with all of the goodness and none of the guilt. Oh hey. In a day or two, you’re going to be at the store grabbing limes for your Cinco de Mayo margaritas (you are picking up limes for margaritas, right?!) Well, grab a couple extra. And a couple more. Because this might just be your new favorite green smoothie recipe. It’s definitely mine. 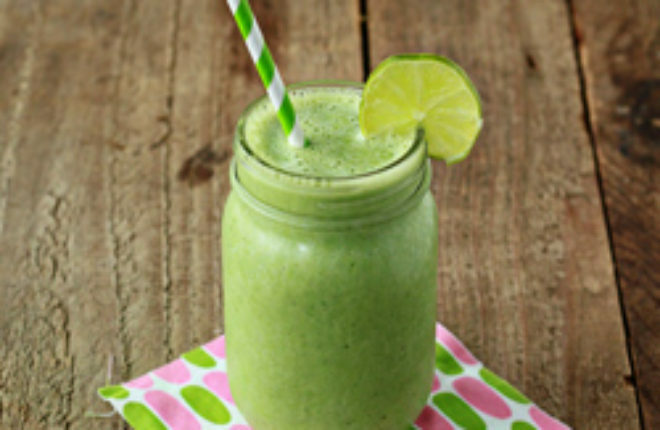 And after you down all those margaritas on Sunday, starting off Monday with a healthy, vitamin-filled green smoothie is going to sound mighty nice. So you might as well be prepared. (Be sure you’ve got vanilla yogurt, spinach, and bananas in your cart, too). 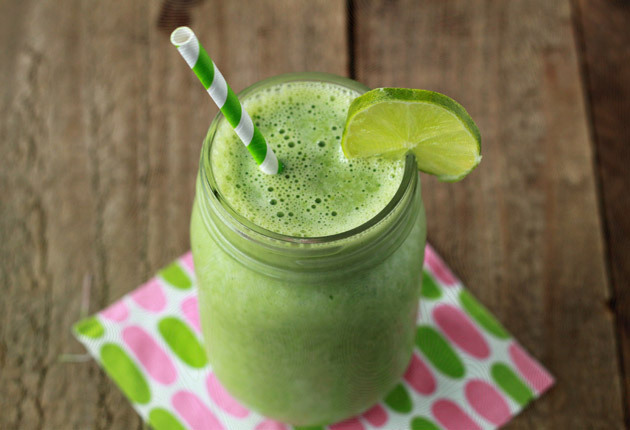 I love my green smoothies – okay, so I’m borderline obsessed with them. Seriously, they’re such a creamy, sweet, fruity, milkshake-y to sneak tons of nutrients into your diet. I love them for breakfast, as an afternoon pick-me-up, after yoga class … pretty much any time I can think up an excuse to have one, I’ll have one. And especially this one. With its tangy citrus and sweet vanilla, it’s a little reminiscent of a creamsicle. All of the goodness and none of the guilt. Not that we (four margaritas later) know anything about guilt. 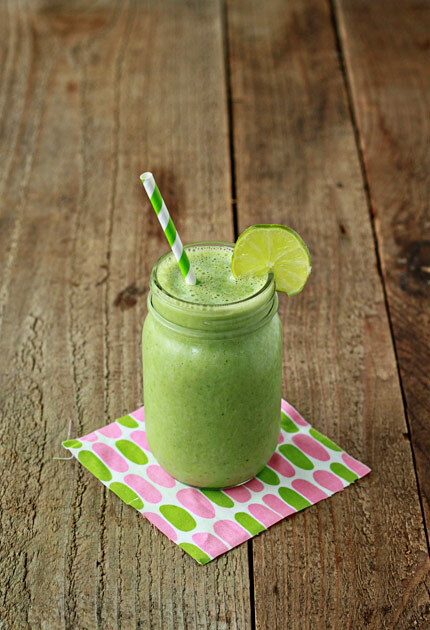 I’m pretty much obsessed with green smoothies too and now I’ll have a new one to try–woo hoo! I mix Kale and Spinach together. I is really good and Kale is packed with nutrients! I have been drinking green smoothies for about three weeks now and have notice such an improvement with my digestive system. I love it! I was taking medicine for my stomach and since I’ve started drinking these I haven’t had to take any! I can’t get enough green smoothies in my belly these days. (especially with the nicer weather!) This version sounds fantastic! Green smoothies are the best invention ever. Well … there’s the iPhone. Okay, the best *food* invention ever. I’m pretty obsessed with green smoothies too and make one least twice a day. Sometimes for a dessert shake I’ll just add more fruit. 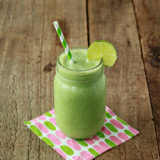 Yours vanilla lime smoothie looks fantastic! This smoothie recipe is absolutely DELICIOUS! I was looking for a good way to use up some leftover limes and spinach and this was perfect! I made modifications because I was missing two ingredients, but the taste was still fantastic and proof that the recipe is quite resilient. I only had blueberry yogurt so I used that instead, and my boyfriend finished up the milk this morning so I subbed pineapple juice. I’ll be making this for him tomorrow morning! Thanks! I happen to have all of these ingredients in my fridge right now. I will try it in the morning. Oh this sounds sooo good!!!!! I just finished this green smoothie, and I have to say I want to make it again this week! The Vanilla Lime Green Smoothie was my very first at-home green drink attempt. The serving fits perfectly in a large glass, and has dominant banana and vanilla flavors. Thank you for sharing this recipe. Great idea! Let us know how you liked it! Hi there, so I ended up trying the smoothie and I LOVED it! The combination of vanilla and lime was spot on. I would be interested in the nutritional values for this smoothie. This looks great, I’m going to try it with vanilla almond milk and bok choy. I made a few modifications to make this a substantial pre-swimming fuel (use plain full fat instead of vanilla yogurt to reduce sugar and round it out, added 1/2 scoop protein powder) and I also added about 1/4 cup fresh cucumber from the garden and it was lovely. The color is much more appeasing than other smoothies I’ve tried, as well. I’ve had this smoothie recipe bookmarked for over a year and happened to have all the ingredients this morning…wow. This is one tasty smoothie that isn’t grossly thick or tasting predominantly of spinach. I love it! I love that you added lime to a smoothie! I love it in anything but hadn’t thought to add it to a smoothie. This is brilliant! Great way to get your kids to eat spinach if they won’t! This looks great. I have no idea why I have never thought to put lime in a smoothie before!! This sounds delicious, and I love the color. Can’t wait to try it! I just feel better all day when I have my smoothie! I like the super greens mixtures.. and really I don’t taste them at all.. if I do I just add a little more fruit. I’ve never put vanilla in my smoothies though so I want to try that! 🙂 Thanks for the recipe. Yummy! I left out the yogurt and used agave nectar instead of honey, but it was still pretty dang good! Definitely adding this one to my smoothie rotation! do you have the calories/macros for the smoothie? In an accident and money was an issue, my mom gradually moved us down (though when she tried putting powdered milk in old cleaned cartons, we did draw the line – vile); whole milk is like creme for coffee: rich. And it’s super easy to use a good vanilla soy or almond milk as a total or partial replacement. Someone mentioned sugar content – it’s how I choose everything! The more expensive Greek vanilla yogurts are priocey but less sugar; I often mix plain house-brand yogurt. I hate bananas when they get just a bit ripe, so first put in fridge and then freeze, as is. A quick defrost in the microwave, the skin comes off and no need for ice! Don’t let the black skin throw you – you’re composting it anyway! Limes & lemons are staples and will even whiten your clothes much better than bleach. And I’m a convert to stevia and the alcohol based sweetener that prevents tooth decay. Both come in liquid extract forms (flavored too) which makes for a smoother drink. Smoothies are a great way to avoid tossing produce; if it’s getting on just a bit – throw it in! And real vanilla extract is worth every penny. Also a great way to save money is to check out the bargain area in markets or with the locals at any farmer’s market as they want to sell out. Smoothies are kind to bruising and soft fruit and vegetables! Karen Troughton This looks incredibly rich, fudgy and tempting! I hope they taste as great as they look. Great photos. OMGGGGGGGGGGG! MADE IT FOR THE FIRST TIME. SOOOOOOOO GOOD! Im allergic to bananas, is there another fruit that would work with this recipe? Half an avocado will give it some nice creaminess instead of the banana. Do you have the nutritional info on this including the calories?